In the fashion community, few social media platforms are as beloved as Instagram. Whether we're sharing snaps of our latest #ootd or browsing through other fashion people's fabulous posts from runway shows, parties, and beyond, Instagram is where it's at. There's only one problem. Posting a photo to Instagram, of course, isn't really a hard thing to do—the challenge comes in crafting the perfect caption to accompany the image. Some of our favourite It girls are really good at it—we're looking at you, Alexa Chung—and while we take inspiration from their daily musings, we thought it might be wise to pick the brain of a bona fide social media expert. And that's just what we did. We sat down to chat with Michael Kwolek, the director of research at social media consultancy firm Room 214. We asked him to share his learnings on the types of Instagram captions that work—the ones that increase engagement, are prone to getting you more likes, and generally make people like you more on the platform—and, of course, the types of captions that don't work. What he had to say really surprised us. 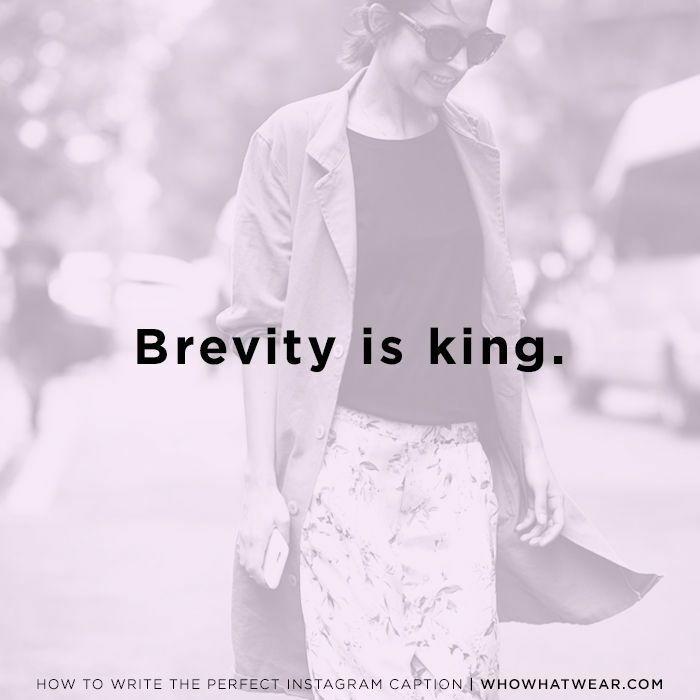 Keep scrolling for an expert's tips on how to write the perfect Instagram caption! "Brevity is so important," Kwolek tells us. "I like when people just use a caption like 'This.' [to go along with their image]. That’s always a good go-to. Something super brief. It should be shorter than a tweet." It's true: All those people you follow who like to #hashtag #every #word #in #their #Instagram #posts—they're doing it wrong. "Do not hashtag every word in your caption!" Kwolek emphasises. "That’s a definite no-no. Hashtags should be relevant; for example, #ootd is still super relevant. When you use it, you feel like you’re part of a bigger conversation, like you’re actually part of something. It’s distracting if you put a hashtag that has no relevance, if there's no reason to click on it, just something you made up on the spot—it’s a dying joke, and it just makes it harder for people to read your caption. If it’s relevant and it’s worth searching inside Instagram, that’s cool." "Proper spelling, capitalisation, grammar: Those are still important to people," he says. "If you want someone to read what you’re saying, you have to make it legible. It’s such a basic thing, but it’s so important. There’s a lot of funny and interesting slang that’s happening out there, which is totally fine and relevant, but when you’re abbreviating every word you use and there’s no correct grammar, people see that, and they’re like, 'I can’t even understand this, and I’m moving on.'" "Add value to the image with the caption," Kwolek recommends. "When I scroll through Instagram, I don’t necessarily even read the captions. If you want to have a caption that people are actually going to want to read, you kind of have to build that up with the image first. You want people to say, 'I’m going to look at this image, but hey, I’m going to read this caption too.'" "I think it’s about having a really strong point of view about something," he says. "You really want to hear a person's personality through their Instagram feed. When someone gets too pretentious on Instagram, it can be a turnoff." For all the blushing brides out there, this one's for you: Event-specific hashtags are lame, according to Kwolek. "When people come up with hashtags for their vacation or their wedding, that kills me a little bit," he admits. "It’s definitely not my vibe—it just feels a little pretentious to me. You’re not that special that you’re going to start some trending hashtag because of your vacation to Florida. Plus, it adds visual clutter where there shouldn’t be any—we should be letting the images speak for themselves more. Just show me something beautiful." Yes, à la Beyoncé, Instagram photos without captions reign supreme. "That’s actually not done enough," Kwolek says. "When you hashtag something, you’re just basically saying to the Internet, 'Please, I hope other people see this.' When you don’t hashtag it, it’s like you're saying, 'I’m letting this image speak for itself, and whoever sees it sees it.' Beyoncé doesn't use Instagram captions, because she doesn't need to. We can all only aspire to be more like Beyoncé." How do YOU approach writing Instagram captions? Tell us in the comments below!